There is nothing like a rainy day on Cape Cod. The smell of the sea, a little fog blowing in to soften the edges, a cup of coffee next to a fire to start your day…for a rainy day it does not get much better. Are you looking to stroll and shop or is a bit of adventure more to your liking? Maybe a mix of the two? One of our favorite towns on the Cape is Chatham. It is quintessential Cape Cod and one of the best strolling towns around. The rain is not a bad thing, you would probably be on the beach if it was not raining and then you miss some of the Cape’s best shopping. If you stay on Main Street you will have plenty of great, whimsical shops to stop in and there are lots of restaurants and candy shops to keep up your energy. One of our favorite stops is the Eldredge Library, it takes us back to library days with Grandpa. 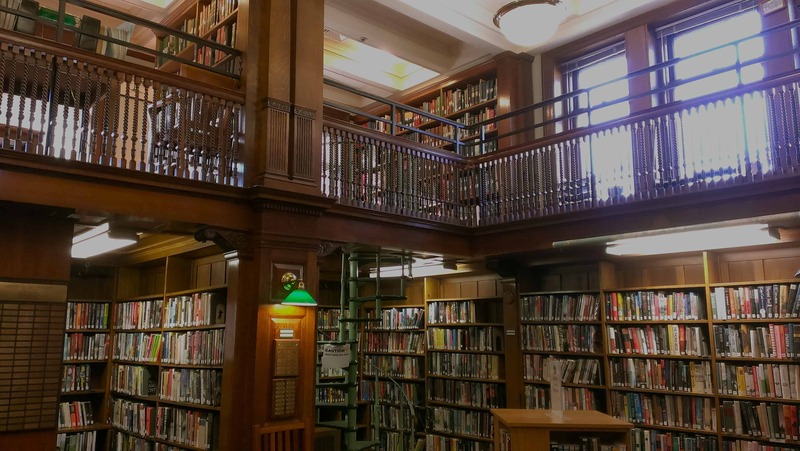 Dark wood paneling, little nooks between the shelves for reading, and the highlight…the spiral staircase that winds its way to the second floor. Don’t forget to stop at the Chatham lighthouse and the overlook of the gap in the outer beach. 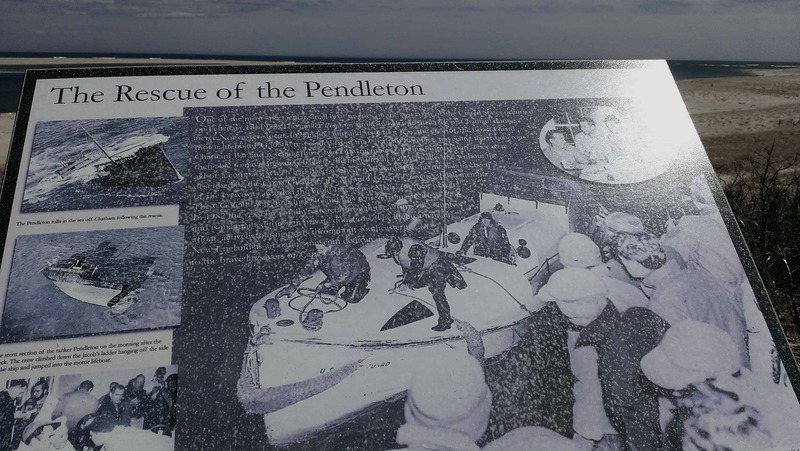 They just completed filming “The Finest Hours” there which is the story of four men who rescued the 32 men of the doomed Pendleton…and they launched from the Chatham lighthouse in 60 foot seas! Plaque commemorating the rescue of the crew of the Pendleton. If you want to get out and explore you have the perfect opportunity, far fewer people will brave the weather and abandoned beaches make for an exhilarating adventure. The Cape Cod National Seashore has a ton of nooks and crannies that the typical vacationer does not get to see. 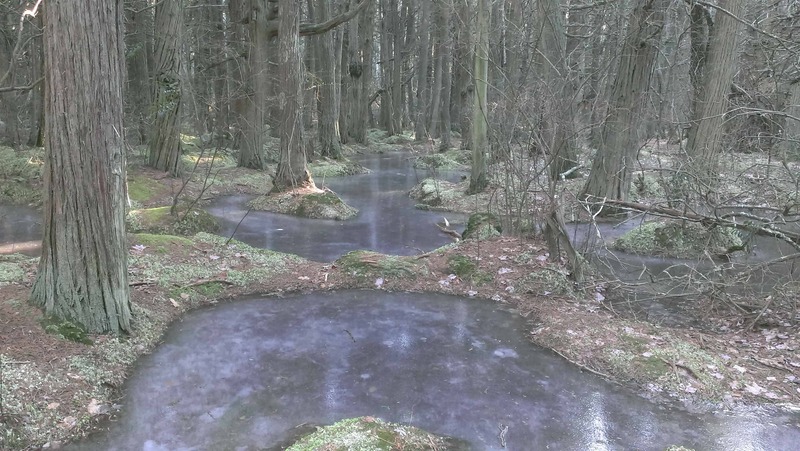 Did you know there is an Atlantic White Cedar Swamp on Cape Cod? Elevated trails help you navigate what surely belongs in Florida, not the Cape! Frozen! Atlantic White Cedar Swamp trail during the brutal winter of 2015. 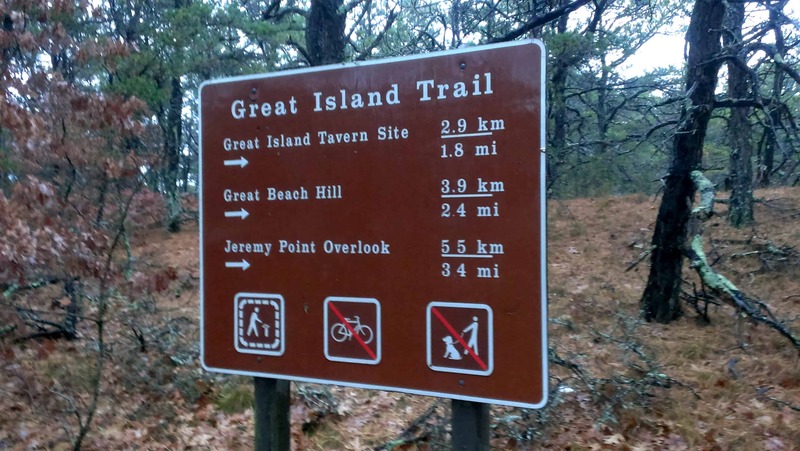 Or, if you want near total isolation…hike the Great Island Trail in Wellfleet. It is a 6.6 mile loop that dips south from Wellfleet into the Cape Cod Bay. Abandoned beaches, trails through piney woods, big sand dunes, and some ancient artifacts (old Whaling Tavern site and an Indian grave) will define your hike. 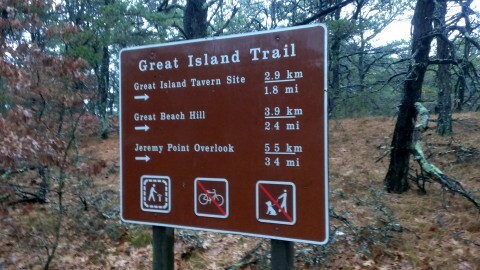 Sign marking the beginning of the Great Island Trail, a great hike no matter the weather. When you are done hiking the Great Island Trail, a do not miss stop is the Wellfleet Marketplace for coffee and pastries. Our favorite is the Chocolate croissant, one of the best we have had the pleasure to eat! If you want something a little more substantial they have a deli and prepared foods. They are stocked with lots of local Cape Cod options from Cape Cod Coffee Roasters to Cape Cod Creamery. 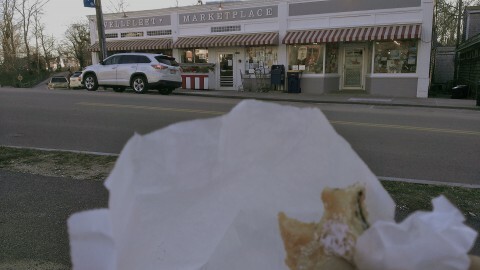 Wellfleet Marketplace…and yes, that is a chocolate croissant in hand! This is only a small sampling of the kind of activities you can use to fill a rainy day on Cape Cod. No matter what you do or how the weather is, Cape Cod will be an unforgettable vacation. We liked it so much we sold everything in Texas, bought this Inn, and became Innkeepers. Come visit us at the Platinum Pebble Boutique Inn and we would love to tell you our adventure over a cup of coffee. See you soon!